Protecting children and yourself on laptop and desktop computers is essential. In this guide, we’ll go through some simple steps that you can do to protect your children and yourself online. On any modern operating system, there are two common types of user accounts (also known as logins) — Standard User or Administrator User. A standard user account can only change some settings and cannot remove installed software; An administrator user account has more privileges and it can change almost all settings and install or remove any installed software. If you are a parent or are keeping someone else safe, We recommend using an Administrator user account while your children or the person/people you are keeping accountable use a Standard user account. Now an account has been created for your children or someone you’re trying to keep safe to use. As a final recommendation in this section, we recommend changing your password (or adding one if there isn’t one) for your Administrator account — so you can only access it. With the accounts sorted, removing software will not be possible for the person using a standard account. 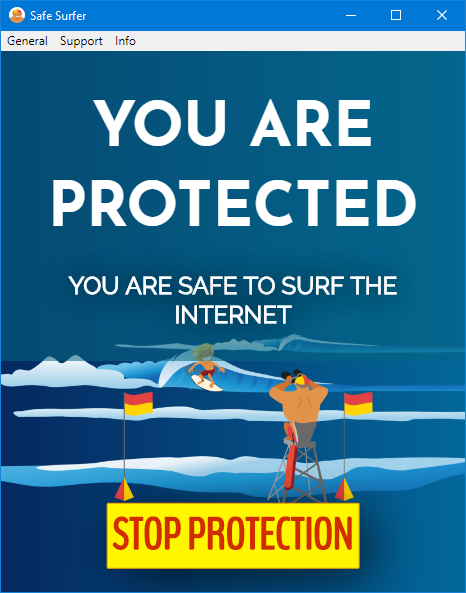 To get your computer set up with the Safe Surfer DNS service start by installing and setting up our desktop app on the computer. Setting up the desktop app means that the laptop or desktop will be safe for on the go and on any network. As a bonus, all users will be protected. the installation and usage of the Safe Surfer desktop app requires access to an Administrator account of your computer, so remain logged in as the account with Administrator privileges. Launch the installer. You may get a message saying ‘Windows protected your PC’, what you’ll need to do is click the ‘more info’ button, followed by ‘Run anyway’. Now that your computer is set up, whoever uses the computer will be protected against any type of harmful material on the Internet.